Nothing easier and more popular to prepare for a crowd any time of the year! This is as easy as preparing a roast Mimi's way. 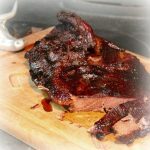 There are also many other good recipes out there for brisket, but this beats all for quick 'n easy! Mix all other ingredients and pour over brisket inside foil. Fold over foil to seal well. Let sit and marinate in fridge 12 - 24 hours. Five to 12 hours before serving, take out brisket and pour out some of the marinade but leave most of it inside foil. I'd like to see 1/2 of the brisket sitting in the marinade. Fold over and cover the brisket very well. Put brisket in a 250 - 275 warm oven on bottom shelf (be sure you hear a light sizzling sound so you know the meat is cooking but slow). Optional: When you take the brisket out, I like to open the foil, spread a little BBQ sauce over the brisket and stick it back in the oven, second shelf from top, under the broiler just to brown the top a little. Let the brisket sit and rest 10 - 15 minutes, then slice against the grain. Serve with potato salad, and something green. Mimi's Tip: Left over brisket makes for wonderful sandwiches. Just shred and put back in the juice and keep in the fridge, or freeze.